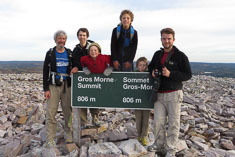 We did the Green Gardens hike today with Jennifer and Jamie and the kids and Mazie. Mazie rode with us and told us stories about George, about how in the last few years of his life he would only go out and visit people if he could drink with them and how he only kept up with those friends who also liked to drink, but also about how tender-hearted and emotional he was. 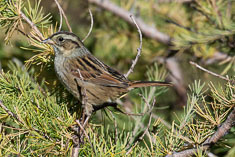 While we waited at the trailhead, we found a Swamp Sparrow in the alder and larch krumholz by the parking lot. 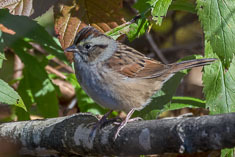 I got a few photos, and was glad to see it because it confirmed my suspected Swamp Sparrow up in the Blow-Me-Downs. 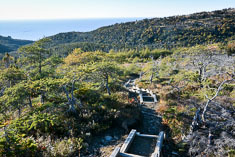 The trail crosses about a half-mile of tablelands then goes over a ridge and drops down through scrubby larch forest into some mature fir groves before emerging on a high grassy shelf above the beach. 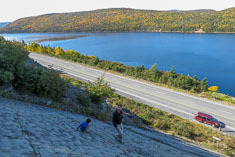 The scenery along the coast is dramatic - steep headlands dropping down to the ocean, interesting cliffs above the water with apparent pillow basalts and steeply dipping layered rocks including a weathered basalt with olivine phenocrysts. The surf has cut a wide bench at the high tide level. 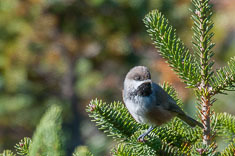 In a fir stand we came across a small group of Boreal Chickadees. I had excellent close-up views but because my arms were too weak to get the camera into position in time I didn't get any good shots. Frustrating. 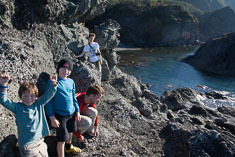 Down along the shore the boys explored some sea caves and climbed around on a sea stack. 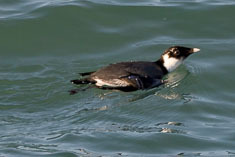 Jamie Silken and I watched a Common Loon still in breeding plumage diving not too far offshore. Jamie built a little driftwood fire and we toasted our sandwiches. The singed bread had a smoky flavor. I dug out my smoked capelin and toasted them over the fire too. They tasted somewhat better warm than cold, softer and not quite as fishy. That's what we ate for lunch back in the day, white bread and smoked capelin washed down with hot tea. 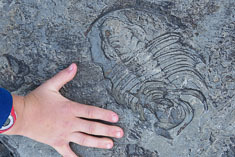 showed us a couple of the remarkably detailed trilobite casts, then we all fanned out to look for more. I didn't get the final count but it must have been close to a dozen, some more complete than others, ranging in length from 2" to about a foot. After a half hour Jenny managed to corral us all back into the van in one piece and we continued on to the trailhead. As we were setting out I heard a Ruffed Grouse drumming. I only heard it once but the muffled beat is unmistakeable. Not far up the trail I also heard a Boreal Chickadee, a species I was hoping to photograph, having not had much success despite excellent opportunities the other day along the Green Gardens trail. I couldn't spot those first couple that I heard but did get OK photos of a couple more an hour up the trail near the base of the mountain. 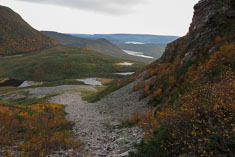 We ate some lunch there and spent another ten minutes watching a couple of moose that some trailworkers told us about. 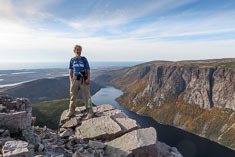 I talked the others into taking the long way up, following the trail that traverses up to the pond and saddle at the NE corner of Gros Morne. Not only did the direct route up the gully look uncomfortably warm but I was hoping we might find some ptarmigan on the highlands north of the summit. 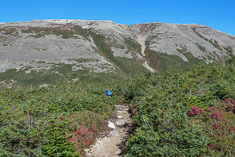 We met several parties of hikers, most of whom warned us that we might not have enough time to complete the loop. I wasn't worried - we still had four hours of daylight and despite a few complaints at times by the two younger boys, we were making good time. 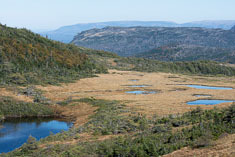 The ponds at the saddle were a bit farther than I'd remembered though. Shortly before we reached them Daley pointed out three white birds flying high overhead. Chunky birds with rapid wingbeats, dove-like except there are no doves in the area. 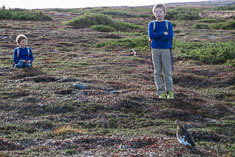 They must have been ptarmigan but unable to release the chest clip on my camera, I missed getting a photo. Not the first shot I've missed due to my weak hands and arms. Up on top I really started looking for ptarmigan. Not that I've ever found them before by scanning my surroundings; I almost always see them only by stumbling over them. But today was different. When I lifted my binoculars to check out a pale rock at the edge of a patch of fir krummholz, the "rock" had disappeared, but another one had appeared a few feeet away. 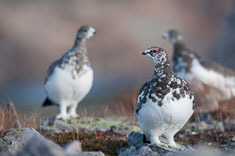 "Ptarmigan" I shouted to the others who were some distance ahead. 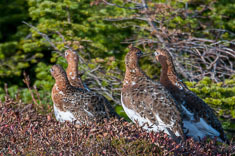 It was a group of eight Willow Ptarmigan. 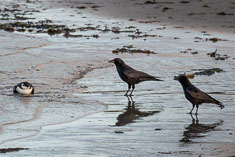 We approached to within about 50 feet then they cooperatively walked right among us. They made soft "koh koh koh" calls and nibbled on the tundra vegetation and every now and then, one of them would do a quick little dance, scampering and hopping around in a circle. I don't know what that was about. 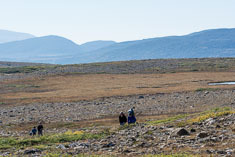 Daniel and I hiked together behind the others, still looking for ptarmigan. 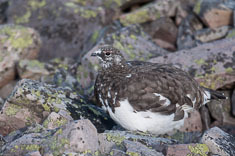 We'd seen Willow but the bird I really wanted to see was the Rock Ptarmigan, a Gross Morne specialty. 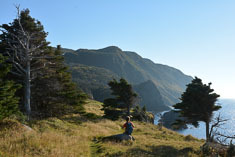 On the way, a stunning view down to Parson's Pond and out to the Gulf of St Lawrence. 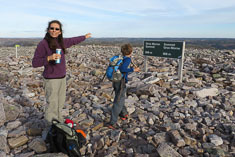 Jennifer and the boys were waiting for us at the summit. 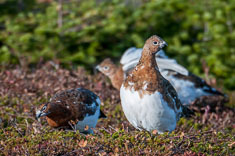 Daley announced that he'd found more ptarmigan, and that they were Rock Ptarmigan. Ignoring Jenny's call for a summit photo, I took off with Daley and he quickly relocated them. With the sun in and out of the clouds, we photographed the Rock Ptarmigan for another 15 minutes before Jenny was able to get us back to the summit sign for her photo. 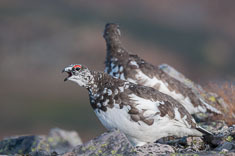 The Rock Ptarmigan were quite talkative, with a distinctive vocalization which sounded like an extended burp. 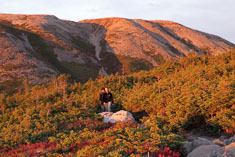 We started down at 5:30PM anticipating a two hour hike down with just about that amount of time before dark. The descent of the gully took almost an hour. Monte called me down at the stream crossing and Tony called when we were about halfway out to the trailhead. 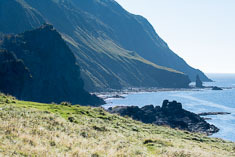 I think of Gross Morne as pretty remote country and Newfoundland a long way from home, so it was odd to be talking with people in Seattle. The sun slipped in under the clouds near the horizon and the light was beautiful. Full of energy now, the kids ran ahead and ambushed us and we pretended to be surprised. The last 5 minutes we hiked by the light of our cell phones with a little help from the full moon. elbow on my camera chest case and leaning back at the waist in order to support the lens. With my weakened arms, managing the lens is pretty difficult now but I was still able to get a couple dozen photos. We stopped by Sarah and Roger's around lunch time and they fed us bread and cheese and coffee then we all walked up to the house together. 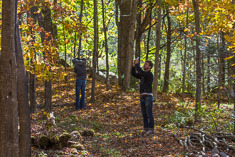 Roger pointed out the areas along the road where he wants to cut out some of the larger trees to make room for the young sugar maples, some of which will be ready to tap in a few years. Rick caught up to us on his tractor and stopped to talk. He's recently filled in the run of small pools across the north lower field which have been there since I was a child, recharged every few years when the river floods. He filled them with gravel from the river topped with soil from along the lower edge of the field. I probably would not have agreed to it had I been consulted but now that it's done, it's done, and I won't be around too much longer anyhow so I didn't say anything. I worked on the computer a while. I need to get tax information to the accountant so he can finish our 2013 taxes. I filed for an extension and paid what I figured was due last April but never got around to giving him the additional information he needed to file. Around sunset I decided to get some exercise, wanting to burn off the caffeine and clear out a few calories to make room for beer and hors d'oeuvres before supper. Daniel and I did a run to the beer store in Glen yesterday and we've got a nice selection - Indian Brown from Dogfish Head, Centennial IPA, Porter and Old Curmudgeon from Founders, Pale Ale from Sierra Nevada. The Old Curmudgeon is rich and delicious but around 10% ABV so I will go for the slightly plainer Indian Brown instead tonight. Out on the road I began to feel sad and alone. Something about the taxes, I thought. I ran the triangle as the color drained out of the clouds, returning by Whitney's and Cheney's (where Nana lived with Aunt Ada when I was little) after a side jaunt up to the Dundee Road. Somewhere past Cheney's I felt a profound sadness and sense of loss. I considered asking Jesus about it then swore at god instead, either for not existing or for foisting this mess on me, or maybe for both. That reminded me of a dream I had early this morning. I'm on a bus, perhaps with Daniel and David though my sense of their presence is vague at best. We're in an amusement park, starting in on a ride following the last official ride car of the evening. That car with its load of riders enters a tunnel at the start of the ride. As we follow it gates made of sheet steel with ribs for strength suddenly begin dropping down from the ceiling both in front of us and behind us. When they are most of the way to the floor I realize with a sense of panic that we will be blocked not only from continuing on the ride but also from exiting the way we came in. I hear the driver shout into his radio to the controller of the ride, "Do not shut it down on me, Rob". There is no response from "Rob" because we are in the tunnel and the signal cannot get out. We'll be locked in. I consider that it will only be for the night and we'll be able to escape in the morning but I wake up anxious anyhow. 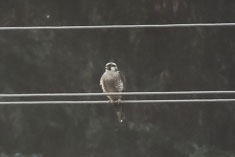 I was on the fence about driving all the way out to Neah Bay to see the Eurasian Hobby that showed up there about a week ago, even though a Hobby would be life bird #600. If I saw it. But David was up for the trip, and we'd probably also manage to see the Tropical Kingbirds and Orchard Oriole, all of which were being reported daily. 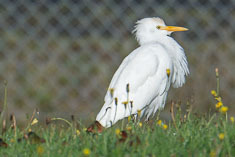 Then on Wednesday a Brambling and a Cattle Egret showed up as well, though the latter was only on the Makah Tribal Center website. 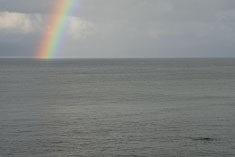 Those sightings plus a favorable weather forecast tipped the scales in favor of the trip. I picked David up at the Federal Way Costco and we gassed up for $3.89 a gallon. We were two hours to Port Angeles and another hour and 45 minutes to Neah Bay. In the center of town, where the road runs right along the beach, we stopped ask two birdwatchers what they were looking at. 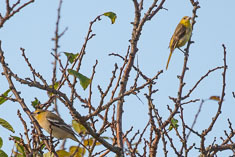 "The Brambling", they replied. We hopped out, and there it was, a stout little boldly-patterned finch quite unlike any North American bird. It's actually a close relative of a Chaffinch. The last time I saw one in Washington was about 31 years ago. We asked the guys about the other birds in town and one of them offered to show us some Tropical Kingbirds and the Orchard Oriole. We found them both within five minutes. 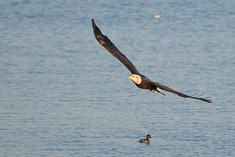 We got a few photos of the three rarities then towards sunset decided to head over and scout out the Hobby. 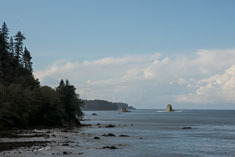 We followed the Cape Flattery Road a mile or so out of town to the Wa'atch River. 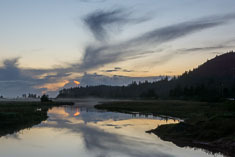 I don't know where it comes from but the river runs southwest from Neah Bay through a flat valley about a quarter mile wide, all open marshy meadows between forested hills of Sitka Spruce on either side, and flows into the Pacific at Hobuck Beach. It's a pretty spot; I should have taken more pictures. 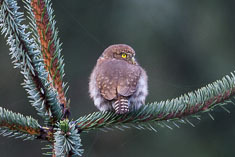 We found a few birders searching in vain for the Hobby, but one of them spotted a pair of Northern Pygmy Owls in some low alders along the road. We watched the owls until dusk then drove back to town, ate at the Warmhouse Restaurant (nothing special) and continued back four miles to The Inn at Neah Bay. Spacious place, friendly owners and large rooms, though a bit chilly. I was sitting in the upstairs lobby when I heard familiar voices. 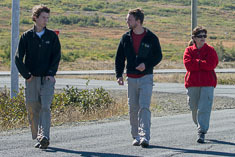 Ken, Ed, Laurel and Diane from the Advanced Birding Club had just driven out from Tacoma. I reported that we'd seen the Brambling, Kingbirds and Oriole within ten minutes of arriving in town but hadn't seen the Hobby though we'd talked to people who had. We arranged to go look for it together at 7:30 tomorrow. We were a few minutes behind Ken and crew but we met them over the rock quarry along Wa'atch Valley, where we spent a chilly hour waiting for the sun to rise. While the far side of the valley was still in shadow, someone spotted a promising bird on the power lines. Half a dozen birders scoped it and hoped at first that it might be the Hobby, then decided it was a Kestrel before settling on Peregrine. Ken and Ed after closer inspection decided it was a juvenile Prairie falcon. I favored a tundrius Peregrine but Ken said they don't really occur in this area. I checked Sibley and had to conclude that Ken was probably right; the juvenile Prairie Falcon and juvenile tundrius Peregrine look almost identical. After a while the bird flew off, looking a lot like a large falcon, but I hadn't talked to Ken yet so didn't think to look for the dark axillars which would identify it as a Prairie. 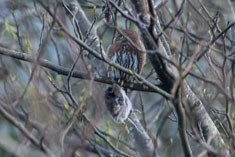 An hour or so later the same bird reappeared on a snag above and behind the quarry. Viewing it through the scope in good light, we confirmed that it was after all a Peregrine. For the next three hours not much happened. The previously reported cattle Egret showed up and provided a little distraction from the absence of the Hobby and several people, myself not included, found a Swamp Sparrow. I spotted a warbler briefly but couldn't identify it though it was probably an Orange-crowned. 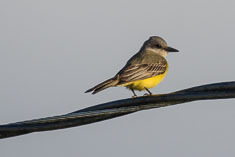 I drove over to Hobuck campground and found a Merlin, then David and I drove down the gravel road back towards town and photographed another Tropical Kingbird. Laurel called me to report that the Hobby had most likely been seen so we returned to the crowd of about 100 birders between the two bridges and waited. 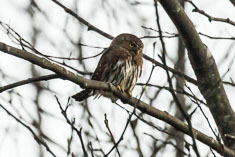 One of the Northern Pygmy Owls showed up along with a couple of Swamp Sparrows. This time I managed to glimpse one of them. Some time after noon David spotted something soaring above the ridge about a half-mile away on the far side of the valley. He got it in the scope then handed the scope off to me and I followed it for about a minute as it circled up higher and higher then begin to glide towards back across the valley towards where we were gathered. I begin to get excited. 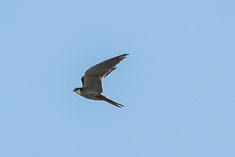 It was clearly a falcon with a slight build and very long narrow wings. By the time I had the courage to call it, the Hobby was practically overhead. Other birders got on it and immediately confirmed it was the long-awaited Eurasian Hobby and my long-awaited 600th North American life bird. For a few minutes David and I were very popular. 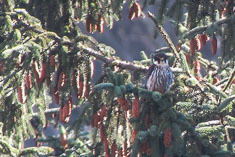 After about an hour of watching the Hobby perch backlit very high in several of the Sitka Spruce above the valley, most of the birders drifted back into town. David and I ate a little lunch and followed them. 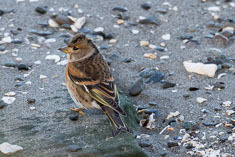 The Brambling was still hanging out on the beach with a couple of Savanna Sparrows. 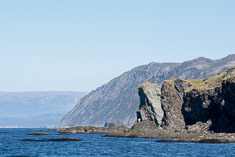 We were happy to see that the Black-legged Kittiwake was also still in residence on the rock just off the beach. While we were trying for photos, someone reported that a Baltimore Oriole had joined the Orchard Oriole at the feeder down the street, and while we were photographing the two orioles a Rock Sandpiper was reported behind the mini-mart. 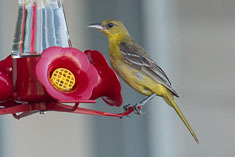 The Baltimore Oriole turned out to be a less exciting but still rare Bullock's Oriole. 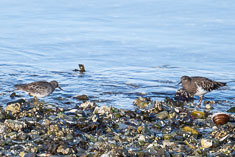 After we photographed the Rock Sandpiper, things quieted down. We searched unsuccessfully for the Clay-colored Sparrow; it would turn up again tomorrow. At our last stop in town, the parking area and breakwater behind the restaurant, I photographed a beached murre being inspected by crows. I think the murre was starving; the keel of its breastbone seemed to protrude. I found some comfort in the reminder that we all die, and hoped that for the murre it would come by night, before the crows returned in the morning. On the way out of town we happened to meet Ken and the others at the Sail Rock overlook where they were looking for Black Oystercatchers. Shortly after they left we heard their oystercatchers calling but I wasn't able to find the Ancient Murrelets I was looking for before dusk ended our day. 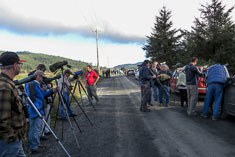 Nonetheless it was a remarkable day of birding, with 75 species overall including nine new state year birds. When Sarah and Roger were here a week or so ago, we were shopping at Whole Foods and on a whim I bought scallops (the smaller "Bay" scallops since at $13.99/lb they were half the price of the large ones) and squid rings and tentacles (cheap at $6.99/lb) to fix for supper. Per the fish counter guy's instructions, I sauteed them briefly on medium heat in olive oil with a bit of garlic. Too briefly. The scallops were well-received but the squid were still translucent and disturbingly soft, slimy and chalky in the mouth. Tonight I got it right. I sauteed four cloves of sliced garlic in olive oil then added a quarter pound of squid and a handful of chopped parsely. When the squid pieces were white and had shrunk by about a third (5-10 minutes on medium heat), I added the scallops and sauteed (or perhaps braised, since the squid had exuded some liquid) them for about 5 minutes, adding a little tarragon and Greek-style seasoning salt along the way. 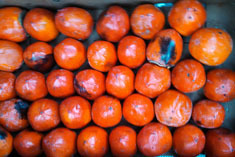 They were delectable. The only change I would make next time is to chop the squid rings so they become more part of a sauce for the scallops, leaving the tentacles whole (and perhaps removing them earlier so they don't get tough) for visual effect. I enjoyed a quiet dinner, the scallops and some steamed zucchini and a glass of fragrant "Nothing But Flowers" session IPA by Black Raven Brewing, grateful that my debilitated arms retain enough strength to chop garlic, flip the contents of a skillet and carry everything to the table. Not to mention handle a fork and raise a beer glass. That latter act requires using my forearm as a fulcrum, pushing my elbow down to lever the glass up to my lips. The two-fisted approach still works too most of the time. Cleaning up is a delicate task though. Resting my forearms on the edge of the sink, I hold each plate and glass with two hands at all times and make no sudden moves lest I drop them. It's a project. Most things are projects now - showering, brushing my teeth, getting dressed, sweeping the floor, making the bed. My housemate Ellen asked me what does it feel like, as I was attempting to hoist my sleeping bag up to the overhead cupboard where it resides. I had to think for a moment, and realized that it doesn't actually feel like much. There's some sense of fatigue but basically the biceps don't flex, the arm doesn't bend, the shoulder won't lift the whole assembly more than a few degrees off its default hang-straight-down position unless I snap my upper torso like a whip to throw the arm and hand up to where I want them to go. 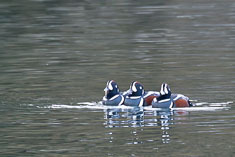 Ed and I went birding at UBNA, formerly known as the Montlake Fill, this morning. 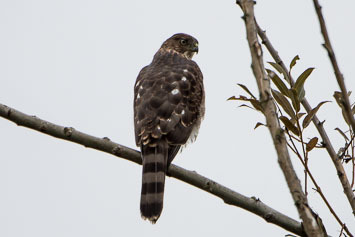 A Red-shouldered Hawk was reported there yesterday. 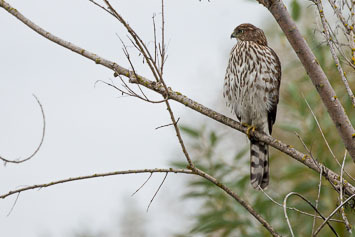 We of course didn't find it but we had nice views of a juvenile Cooper's Hawk. For once we had no doubt about the identification. Although the bird was smaller than a crow, the tail was nicely rounded and the streaking was fine on the breast and faded out on the belly. Among the 50 species on our list we had several Lincoln Sparrows and a Northern Shrike. 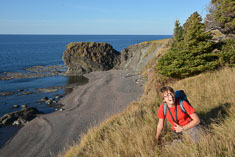 It was basically a trip to look for Ancient Murrelets while they're still around. Though they've been reported, as they often are in early November, from the Dash Point fishing pier, I figured I'd have better luck up by Port Townsend - the Keystone ferry, Point Wilson and maybe out towards Port Angeles - and it would be a good opportunity for a hike out Dungeness Spit as well, something I've always wanted to do. 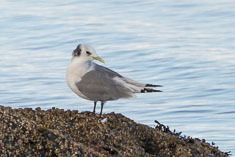 I left too late to try for the Franklin's Gull at Spencer Island so drove directly to Mukilteo and ate a quick lunch in the car waiting for the ferry. 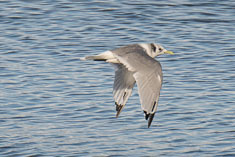 I looked for murrelets on the way across to Whidbey Island but as usual, saw few birds of any kind. At Keystone I scouted along the beach for alcids and the recently-reported Clark's Grebe and found a pair of Marbled Murrelets but no Ancients. My ferry reservation had gotten lost but I made it on the boat anyhow and while I waited, I photographed a family? 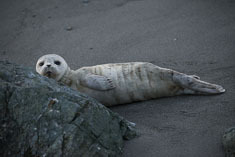 of California Sea Lions thrashing salmon at the mouth of the harbor, a group of Harlequin Ducks in the harbor and a young Harbor Seal on the beach. 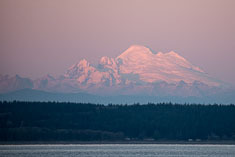 The sun set during the crossing, around 4:30 I think; Mt Baker looked great in pink. Birds were more numerous on this crossing than the previous one - Common Murres, Pigeon Guillemots, ducks and gulls - but no murrelets. For some reason the cheap motels in Port Townsend were nearly all booked up; after trying the Aladdin and the Harborside, I found a room at the Port Townsend Inn, perhaps because it is listed online as a B&B rather than as a motel. Comfortable and quiet despite its low rating on Trip Advisor. I ran through town to Fort Flagler before dinner, finding my way using maps on my phone. It was dark and I was surprised by how hilly the route was - the hills didn't show up on my map. On the way back I came across the Fountain Cafe and after showering walked back ten minutes from the motel to eat there. My Oysters Dorado were delicious and the beer was good too, though I forget now what it was. In the morning I slept in until the sun melted the frost off the car then drove over to Fort Flagler and walked the short distance out to the point. For an hour and a half I scanned the channel with my scope but bird activity was fairly slow. 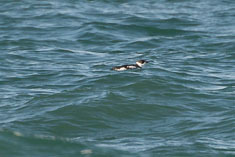 A pair of Marbled Murrelets drifted by too quickly for me to get my camera out. My hands were chilled and even zipping up my coat was a struggle. Handling the camera was almost impossible. A little later another murrelet flew by, low and fast. 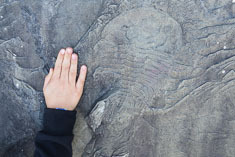 It was all dark above but I couldn't pick out a face pattern or bill color to confirm it as an Ancient. Not good enough for a year bird. The trouble with late starts in the winter is that the day ends too soon. 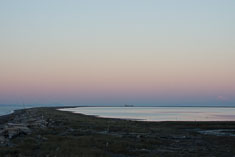 I set out to walk the Spit with less than four hours of daylight left. I wasn't expecting great birding but started a list and carried the scope and tripod. The scope is generally easier for me to use than binoculars at this point. I don't think I was more than a quarter mile out from the bluff when I spotted a couple of murrelets, close enough to the beach to photograph. Though they were Marbled Murrelets, easily identifiable by the white scapulars and dark bill, I was grateful to get the photos. 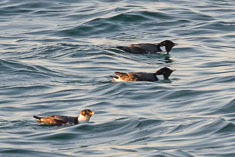 Then not five minutes later I spotted another murrelet and more by luck than skill found it in the scope before it dove. Dark face, white bill - it was an Ancient Murrelet, and the first one I've ever seen well. Very exciting! I ended up seeing a half-dozen of them and getting lots of photos. 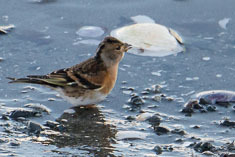 They were actively foraging, often within ten yards of the beach, darting around just under the surface and keeping their wings partly spread even when they weren't underwater. They're much quicker underwater. 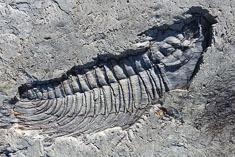 On the surface they often seemed to swim half submerged, as if waterlogged. They give the impression of being very much at home in the water, and in fact I don't think these birds will be going ashore again until next summer. 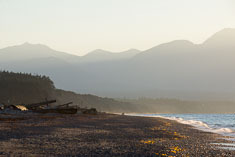 A sign at the trailhead warned that hikers needed to be off the spit by 4:00PM but though I was almost an hour late getting back to the car, no-one seemed to mind. I ended up with 36 species for the afternoon. A few days ago I started a new painting, a 5x7 study of White-tailed Ptarmigans on Snoqualmie Peak. Since I failed to see them this year I figured it would be appropriate to paint them instead. The painting is based on photos I took up there six years ago last month. Ever since then I've had the painting in mind because while taking the photos I couldn't get the birds to position themselves the way I wanted relative to the landscape. It takes a painting to do that, at least given my limited Photoshop skills. The small study came out so well that I'm hoping to do a larger version, probably 12x16. I figure I have 100, maybe 200, hours of painting left in my arms and hands so just maybe I'll be able to pull it off. When I was about half done, I started getting both excited and anxious about the painting. Excited, because I was really pleased with how it was turning out. Anxious, because at that point in a painting I get to feeling that I'm more likely to mess it up than I am to achieve the potential I envision for it. I put on some music to help me relax - Beethoven's Pathetique sonata. But as I resumed painting while listening to the music, I began weeping and had to stop for a bit. I wasn't sure why I was crying, though it seemed to be a mixture of relief that the painting was coming along so well and sadness around the memory of falling asleep to the sound of my mother practicing the Pathetique downstairs in the living room when I was a little boy. Odd that I should cry at that memory for it is a pleasant one. "I guess that's just one of life's little mysteries", I can imagine Mom saying, though come to think of it I haven't actually heard her say that in a long time. I spent the day more or less alone other than a brief visit to the start of the Wattle Waddle Marathon at Gasworks Park. Probably the first time in my life I've been alone on Thanksgiving. Probably the last too - I'll need help to eat by the time the next one rolls around. I felt a little uneasy being alone, even though it was by my choice. It was a pleasant-enough day nonetheless. I'd intended to run the Wattle Waddle but my right outer midfoot (an old running injury, one of my first) was sore all day yesterday so I figured I'd better not, especially since I don't want to miss Seattle on Sunday. I looked through photos from the past year instead, picking out a dozen or more that I'd like to paint. Optimistic, that. Around midday I decided to run out on the course and see some people but I left too late so just ran over to the finish instead, almost six miles each way. All but one of the runners had finished and only a few were still hanging around. Monte, Leslie, Peter and of course, Matt and Betsy. Susan was there too; we talked a bit, hugged good bye and I ran home. Foot was OK, though a little sore again later in the day. I fixed a piece of salmon (thank you Bonnie) and Swiss Chard and ate a persimmon for desert. Cleaned up the kitchen then finished with a cup of decaf while I worked on a brief talk for the Hope Advent candle lighting ceremony Sabbath at church. I laid out a sequence of Bible verses but couldn't add anything of my own to them. Hard to preach what you don't believe - all those verses about hope, and none of them ever fulfilled. Nonetheless at some point in the evening I felt distinctly grateful - for my run, for dinner, for this place I'm calling home, for my still-functioning arms, for family and for friends. The feeling passed but it felt appropriate while it lasted. Now wind whistles around the eves portending rain for tomorrow. Maybe I'll paint. I was in the garden in Auburn. David pulled up a stake near the garden gate to move it to another place in the garden. A blue-flowered morning glory was attached to the stake and it broke off at the base just above the roots. I was angry about the morning glory and shouted "Ripped up by the roots", then I felt a bit ashamed about yelling at David because he hadn't intended to pull up the morning glory. Still angry, I walked away, and up by the workshop shouted again "Ripped up by the roots". In the garden in one of the raspberry beds, I saw a glass beer mug lying on its side on freshly turned earth. The beer mug reminds me of Daniel; abandoned in the garden it represents my death, as does the morning glory ripped up by the roots. I think David represents me, as if I am responsible for my own death which will affect both of them. Pulling up a stake is an symbol of departing - I am leaving them behind, and also losing them, by dying. I'm angry about that. An odd sight - fish trying to swim out of the lake. That's how it first appeared when I noticed splashing along the shore at the southwest corner of Green Lake while I was out for a run this afternoon. 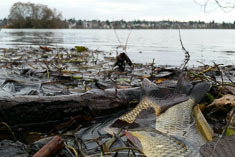 I stopped to investigate and found dozens of scaly golden-brown fish burrowing under the dead leaves along the shore, flapping their tails as if to propel themselves into the muddy bank. As I watched I realized that clear water was flowing out from the bank into the lake. There must be springs along that shore, spawned on Phinney Ridge and still flowing despite the intervening impediment of Aurora Avenue. I'd noticed a sign earlier warning of a toxic green algae bloom in the water; perhaps the carp were attracted by the inflow of the fresh spring water. Before I realized that I attempted to "rescue" a few of them by tossing them back out into the lake but the effort was pointless. The fish showed little interest in rescue and in any case my arms weren't up to it. I couldn't throw any of them more than a few feet offshore. I'm much happier with the camera in my new Samsung Galaxy S5 than with my old Droid Razr. I carry the phone with me when I'm out running and am beginning to remember to dig it out when I see a memorable sight. 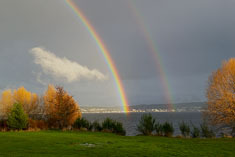 In this case the memorable sight was a glorious double rainbow over Lake Washington just east of Magnuson Park. 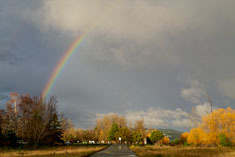 I worked on the Maniac-Halffanatic database merge all day long so didn't get out for a run until near sunset, just in time to catch the rainbow as I reached the lake shore. 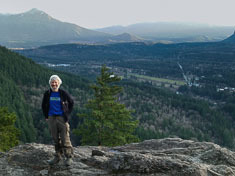 I did the Little Si loop in North Bend this afternoon, scrambling up the ledges on the east end of the ridge then following the trail back down from the summit. 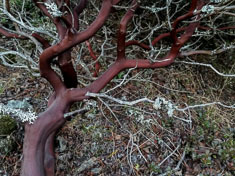 It's one of my favorite short hikes around here not only for the somewhat challenging scrambling (significantly more challenging than it used to be now that I can barely lift my hands above my waist) but also for the interesting flora, including Manzanita and Shore Pine, uncharacteristic of wet western Washington. The sun set before I reached the top but I made it down before dark. When I reached the car I checked my phone and I was just shy of 10,000 steps after the 3.5 mile hike. My phone keeps track of my steps for me and gives me a gold star when I reach 10,000. I woke up from a dream this morning. 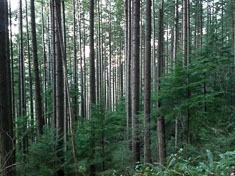 I was standing on the forest road between the Alpental parking lot and the Snoqualmie Mountain/Snow Lake trailhead. Looking up towards the waterfall I saw an elk and a deer side by side crossing the stream onto the brushy slope of Snoqualmie mountain, then I realized that the deer was a moose. 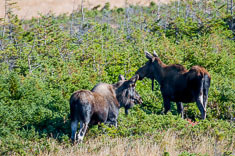 I pointed at them as the two animals turned around and crossed back over to the Guye Peak side. Looking back down to the parking lot I saw two men, one tall and one short and slender, out near my car in the middle of the nearly empty lot. 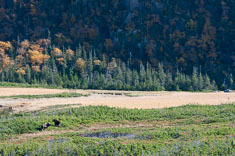 They were related to the two animals somehow; the taller man was the moose. He took something like a book from my car, opened up his long dark coat and slipped the book into an inside pocket. It reminded me of a cartoon of a man opening his coat to show dirty postcards inside it for sale. When I realized the man was taking something from me, I was upset and decided to confront him. It was a 6 foot jump off a wall into the parking lot from where I was standing so I hesitated for fear of hurting my feet, but I didn't want the man to get away so I jumped and my feet were fine. I ran over to him and demanded my book book, and he gave it to me. As I returned I was afraid he would pursue me but he did not. 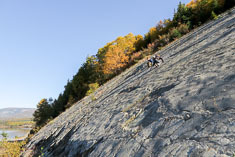 The wall had been graded and was now a steep gravel bank and I worried that it might be too steep to climb up, but I made it with no difficulty. In this dream of fears confronted and overcome, I achieved everything I set out to do. The book was about the size of one of my handwritten journal books, maybe a bit larger and thicker but with the same appearance. I think it represents me in some way, and despite my fear of the moose/man, I reclaimed the book from him. The moose which was initially a deer represents Dad I think, who hunted deer before moving to Newfoundland where he hunted moose. The elk represents me in that I hunted elk in Colorado, but I also hunted deer there so the deer/moose is also associated with me. 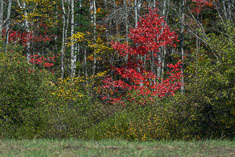 The sight of the two animals silhouetted together against straw-colored grass and bushes either bare or losing their yellowed leaves immediately reminded me of hunting season. 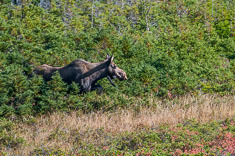 Dad and God are intertwined for me psychologically, so reclaiming the book from the moose/man may represent taking my life back from that critical parental authority, or it may represent my taking responsibility for my own life rather than looking to a virtual parent to tell me how to live. Trailer camping with a thin older man (like Randolph, Dad's hired hand in Nfld. Trailer was open, steel, mostly empty (Dad's in Deer Lake? ).I was trying to pack bottles of beer so they wouldn't break. We drove to a new place, sharp turn into driveway on grassy hillside, parked in partly walled-in area, an abandoned building where we would spend the night. Unpacking trailer with the man, I found a plastic bag full of used cat litter damp and crusty with urine and cat poop. I wanted or maybe needed to dispose of it for Susan before we saw her the next day. Carrying the bag of poop, I followed a short trail through weeds up a low bank from the place we were parked. The trail led into the foundation of a ruined building, low concrete walls outlining rooms with dry straw-colored weeds growing everywhere. I thought I might find a place to bury the cat poop, but then I realized that just beyond the ruined foundation was a low wall and beyond that, the ocean. I would not be able to dispose of the cat poop because I was too close to the water and did not want to pollute it. 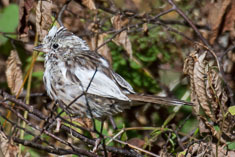 I noticed movement in the weeds and saw a White-crowned sparrow, not unexpected in the late fall. 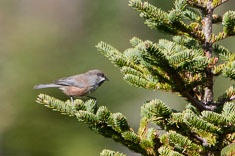 Then in a bush nearby I saw a Tufted Titmouse, which was out of place on the west coast. Higher in the same bush I then saw a Warbling Vireo, a gentle-looking bird which should have already flown south for the winter. I was horrified to see that the feathers and skin around its eyes had all been torn away exposing bloody red flesh and bones. I don't think I ever did figure out what this one was about.